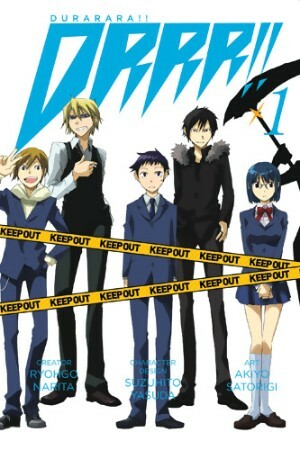 Comics In 5 Panels: Manga-Mania May: Durarara. 15 year old Mikado had quite a quiet life in his little hometown, witch he has never left. No vacations, no school-trips, no nothing. So moving into a big city would be a great shock for anyone in his shoes. But this is not just a big city, no sir! It's one with a mysterious biker, a strong man dressed as bartender, and a head of great importance for many. Mikado moved to Ikebukuro because he wanted a interesting life. He sure as hell got one! 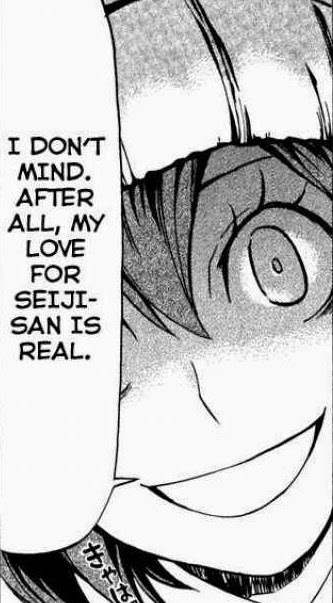 This is a light-novel series, turned manga, turned anime. And I have to say that I prefer the anime(even though I haven't read the novel yet). Dose that mean that the manga isn't good? Of coarse not. Can you believe that THIS was a kind of cute, but persistent girl a minute ago? And that is one of the things DRRR does really well; build up the creepiness. There is this scene in the manga where three people are gathered in a room, and we realize, as the conversation goes on, that it's the start of a suicide pact taking form. And that is not even the creepiest part of the conversation. The art is great too, that also helps building up the creepiness. There is a lot of colorful characters, like Izaya, the probably most unpleasant manga character ever! So go get the light novel/manga/anime, and get one very unique experience. Did I mention that the anime's intro is awesome?